“Cry havoc and let slip the dogs of war!” The military order “Havoc”, was a signal given to the English military forces in the Middle Ages directing the troops (in Shakespeare’s colloquialism “the dogs of war”) to pillage and create chaos. This phrase seems to define the new political methodology of the progressive Democrat Party. Truly, these “representatives of the people” have pillaged the Senate confirmation process and instigated nothing less than fruitless, feckless havoc in the Senate chambers. This “circus in the Senate,” masquerading as Judge Brett Kavanaugh’s confirmation hearings has forever compromised the integrity and efficiency our judicial system, most assuredly for Republicans and Democrats, but more tragically, for Americans. Understand, we’re talking about the Supreme Court, the highest court in the land, where we need our brightest, most dexterous constitutional scholars weighing in on matters of the U.S. Constitution, on behalf of the American people! But who the “H-E - “double-toothpicks” is going to want to throw their name in the hat to become a Supreme Court Justice? Can you imagine anyone more qualified than Brett Kavanaugh seeking to join the highest court in the land? Yet, at the peril of losing a distinctive mechanism of our Republic, progressives have methodically orchestrated his failure, even before they knew anything about the man, much less the adjudicator! Realistically, in the future, what sort of servant will be willing to place his or her livelihood and reputation on the altar of these politically ravenous, self-centered politicians? Imagine, for a moment, that any individual, lacking any sort of verifiable proof, could presume any number of wild accusations against you, ignoring even the most noble of causes. Subsequently, they would force you into proving, beyond reasonable doubt, that you were innocent, or be subject to the unjust consequences of a guilty person. Really? We now have a “presumption of guilt” rather than a “presumption of innocence! My friends, can you imagine the world in which we would live? Anyone wishing to cause any degree of harm, to anyone, for any reason, would be empowered to create havoc in their lives given the proper venue. In fact, this is so upside down in its concept, any sane person would deem it laughable to even make the argument. But not so, for liberal Democrats, who couldn’t give a rat’s hairy backside for your well-being. Do we really pay these people to be this utterly negligent in their sworn duties to the United States? Why do we keep hiring them year after year! While the phrase, “presumption of innocence” isn’t articulated in the Constitution of the United States, as precedent, it’s been a basic component of a fair trial, or the fundamental liberty of Due Process as secured by the Fourteenth Amendment. It is, in fact, the legal burden of the prosecution, to collect and present compelling evidence necessary to convict any individual of a crime. If reasonable doubt remains, the accused must be acquitted. The antics of liberal Democrats represent the antithesis of this constitutional premise. 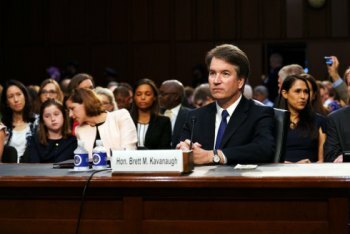 But, in fairness, the nomination of Brett Kavanaugh has never been about guilt or innocence. It’s about blocking a legitimate conservative nominee of the President of the United States, Donald J. Trump, a man duly elected in 2016 by the American people who knew the balance of the Supreme Court, presumably for the next generation, would be decided by the next president. As many are aware, an appointment to the U.S Supreme Court is a lifetime appointment to the highest court in the land. Through the years, the court has been integral in giving us Roe v. Wade, the Affordable Care Act, and many other rulings heavily impacting our lives. My fault, your fault, nobody’s fault, ownership of the ideological balance of the court has become a politically, weaponized tool for which many politicians would sell their soul, as it represents the “supreme” decision-making power in our country when argument meets impasse. Throughout his campaign, Donald Trump made it clear he would appoint conservative judges who would interpret the law, versus legislating political ideology from the bench. He even provided a list from which he would choose his nominees. How can one be more transparent? But trust me when I tell you President Trump could have nominated the honorable, Chief Justice John Marshall and liberal Democrats would have done everything possible to discredit him for the court. It’s really quite sad the crippling concessions liberals are willing to make for Americans and our country simply to propagate their progressive ideology. At what point does this “betraying of one’s country” become treasonous in nature? I submit it already has. Are these the people we want representing us in Washington? Is this the ideology we want infesting our state? Our city? I believe this is a problem that must be addressed on a national and local level, simultaneously. As patriots, we have a responsibility to leverage our vote to return our country, our state and our city to greatness. It’s crucial we begin examining politicians “records and actions” versus “politically expedient rhetoric.” Not only are they doing our people a disservice, they are now becoming enemies of the state, seeking to enhance their power and influence. Liberals cannot be allowed to pillage and create havoc any longer. And it’s up to you to stop them. Get mad if you want, but anything less, frankly, makes one complicit in the offense.